Last weekend we went for a camping trip. So I had to make some cakes, cookies for our trip. 3 mangoes were in my refrigerator, so I thought of making something with them. So I make puree of the mangoes and make this wonderful 2 flavored cake, by using chocolate too. And belive me not a slice of the cake was leftover. I'm sure your kids going to love this cake very much. This the season of Mango, the king of fruits. As a mango lover I wish to have this wonderful flavored fruit almost in every meal. And mango flavored sweet, desserts or bakery is my most favorite. 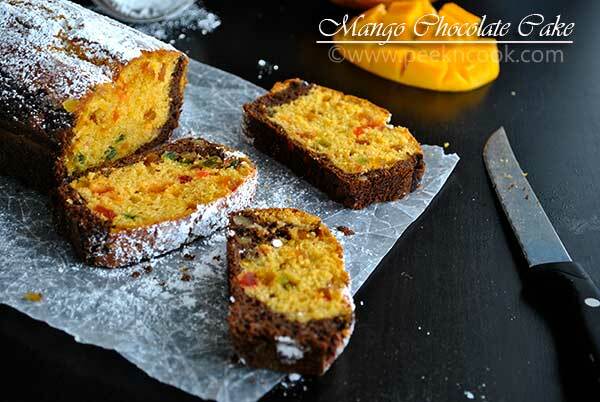 This cake is made with Mango puree, tutty fruity, chocolate powder and some other ingredients. This cake is made with Mango puree, tutty fruity, chocolate powder and some other ingredients. Pre-heat the oven to 375 degree Fahrenheit. Take the butter in a mixing bowl, and beat it with an electric or hand beater for 5 minutes. Now add the egg whites to the beaten butter and beat till the mixture become double in quantity, and keep aside. Take the mango, peel and cut into chunks. Take a grinder and puree the chopped mango. Now take the Maida in another bowl and mix powdered sugar, baking powder & baking soda to it and mix with an wooden spoon. Now take 1/4 cup of the Maida mixture and put in another mixing bowl. Add the cocoa powder to this Maida and mix with wooden spoon. Now add 1/2 cup of the egg white mixture to the cocoa & Maida mixture, mix all together to make batter. But do not beat the mixture after adding flour. Add chopped walnuts to the cocoa mixture and keep aside. Now add the remaining egg mixture, mango puree & hung curd to the another mixing bowl of Maida, and mix all together very gently with an wooden spoon to make a smooth batter. No lumps should be any of the cake batter. Add the tutty fruity to the Mango Cake batter. Now prepare the cake pan by spraying vegetable oil and dusting some flour inside the pan. First add the Chocolate cake batter at the bottom of the pan, and pour the Mango cake batter on the top. Tap the pan to even the batter and place inside the pre-heated oven for 35-40 minutes or the cake is perfectly done. To check if the cake is done or not, insert a clean knife in the middle of the cake and pull it, if the knife comes out clearly, then cake is ready. Let the baked cake cool down completely. Take the cake out of the pan and slice and serve with a cup of tea or coffee. This cake should be consumed within 2-3 days after baking. Do not keep it for a long time. You may add any two other flavors of your choice, like pineapple, strawberries etc. Margarine can be used Instead of butter. Egg yolk should not be added to this cake, as this cake has a beautiful mango flavor.